Among the 328 species of hummingbirds in the world (Schuchmann 1999), none are more local, spectacular, and mysterious than the Marvelous Spatuletail which exists only in a remote valley of northern Peru. It was discovered by bird collector Andrew Matthews in 1835, working for George Loddiges. It was the skin of this first male that became the basis from the drawing of this unique hummingbird by H.C. Richter in John Gould's famous monograph, a portion of which artwork is shown at right (from the reprint of Gould (1990). It remained almost unknown into the 1960s when Augusto Ruschi acquired a wild bird for his aviary in Brazil where Crawford Greenewalt took the first photographs (Greenewalt 1960). The few ornithologists who were able to locate it found it restricted to ~7000 ft elevation (2100-2900m) on the eastern slopes of the Rio Utcubamba Valley in Amazonas, and one site in San Martîn, northern Peru (Birdlife International 2000, Hecht 2001). Ted Parker's observations in the 1970s and 1980s found that full-tailed males were outnumbered by females and immatures (which lack the spatules) by a ratio of more than 5 to 1 (Hecht 2001). The only recent locale where birding tours have been able to locate this little-known species is near the town of Florida, along the shores of Lago Pomacochas. Here it occurs in low densities, may be seasonally present only, and appears to be declining (Birdlife International 2000). In 1997 James Hecht joined a Field Guides tour,led by Rose Ann Rowlett and Richard Webster, which succeeded in locating a very few. Hecht determined to return for photos and did so in 2000, along with Rob Dover of Vilaya Tours. Already the habitat had been considerably cleared and many fewer of the yellow-flowering trees the species appeared to prefer remained. With help from local contacts, they were able to locate the feeding male shown here in these spectacular photographs. According to the information gathered by Birdlife International (2000), the Marvelous Spatuletail [which the British spell as "Marvellous Spatuletail"] occurs in forest edge, and particularly prefers thorny, impenetrable Rubus thickets admixed with Alnus trees. Its preferred food plant is the red-flowered lily Alstroemeria (Bomarea) formosissima but it has been observed on five species of flowering plants, including the "mupa mupa" trees shown here in Hecht's photos. 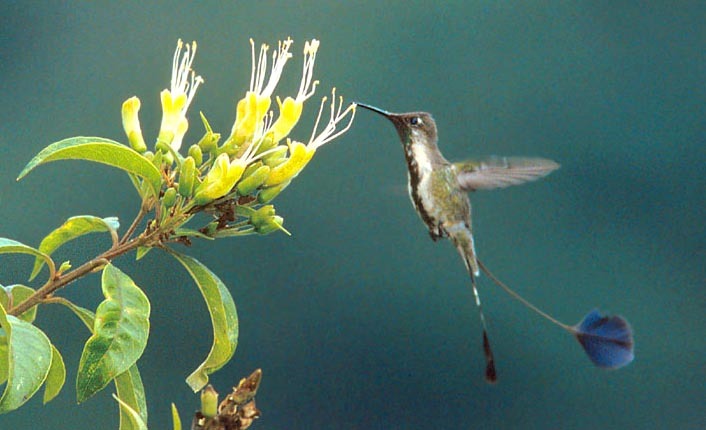 At their feeding plants, the spatuletail, which is a fairly small species, is dominated by more aggressive sylphs, train-bearers, and violetears (Hecht 2001). Males apparently use the incredible spatules to display at leks to females. The breeding season runs from late October to early May (Birdlife International 2000). These incredible photographs were the result of extraordinary efforts by Hecht to search out this endangered species. His full story (Hecht 2001) will eventually be published elsewhere, but for now he has permitted me to post these shots to help publicize the danger this species is facing. It was once thought that this species was not in serious danger because it was a forest edge birds. Yet the burning of hillside habitat in the Andes of northern Peru has accelerated and huge swathes of forest are lost, particularly anywhere near roads. The loss of its favored flowering trees is particularly devastating to this species. Protection of its remaining habitat around Florida is urgently needed, as are surveys to locate additional sites and better understand population dynamics in this most spectacular of all the hummingbirds (Birdlife International 2000, Hecht 2001). 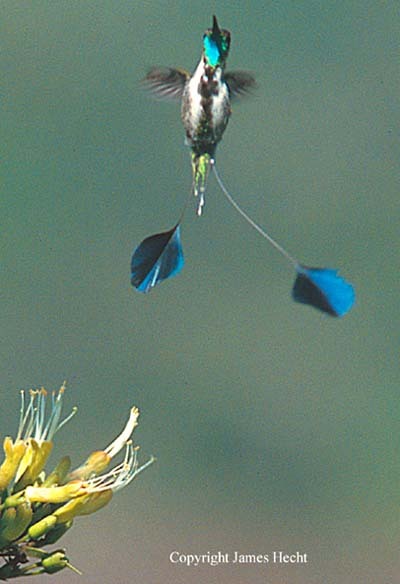 PHOTOS: The photos of wild Marvelous Spatuletail are all from the vicinity of Florida, Amazonas, Peru, in August 2000, and are all © James Hecht, used with permission, all rights reserved. Gould, J. 1990. 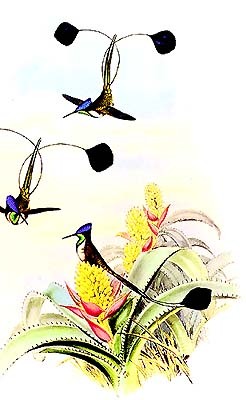 John Gould's Hummingbirds. Wellfleet Press, Secaucus, N.J.
Greenewalt, C. 1960. Hummingbirds. Dover Publ., New York. Hecht, J. 2001. A bird and a road. MS.
Schuchmann, K. L. 1999. Family Trochilidae (Hummingbirds) in del Hoyo, J., Elliott, A., & Sargatal, J., eds. Handbook of the Birds of the World. Vol. 5. Lynx Edicions, Barcelona.